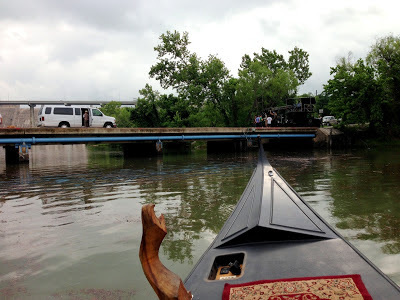 This morning, while most of us in the US were still sleeping, gondolier Steve Elkins stepped on a boat in Austin, Texas and began a very interesting day. He hadn't slept since Friday, as he'd been working, packing, and traveling from California to Texas. The gondola was towed down separately from my operation near Dallas. Steve flew in on a red-eye in stripes and a hat, with a forcola in his luggage. film a TV commercial for an Italian frozen food company. but sooner or later we'll all be able to watch and enjoy it. just below Mansfield Dam - which is at the spot furthest upstream from downtown Austin on what is known these days as Ladybird Lake. row for the camera, with specific angles and movements as dictated by camera staff via walkie-talkie - a perfect job for Steve, as he's also an award-winning independent film maker. First, the boat was launched and towed for an hour and a half to the filming location. Steve grabbed this little snip of video as towing was just getting under way. I find it amusing that towing involved a water skiing handle around the ferro. After an hour and a half they were on the scene. Steve quickly primped the boat for the shoot, and it was "go-time". After about twenty takes, each varying a little from the last, the director had what he wanted. The boat was returned to the ramp, hauled and secured. The job was over before many of us had even gotten out of bed. On my way to BBQ at Rudy's! after that I believe he went back to his hotel and went to bed finally. I hope he slept well, I know I would after a day like that.